Hello everyone, and welcome to this year's Summer of Ghost! Last year Parish Brewing out of Broussard, LA decided to treat everyone by pumping out new batches of their signature hazy New England-style Double IPA all summer long and it seems as though 2018 is going to be no different. The guys over at Parish were busy during the month of May brewing up batch after batch of the delicious brew and then spent the first week or so of June bottling it all up and sending it out throughout their distribution area. On June 14th, all the Ghost was released at once and I had no trouble finding some at Martin Wine Cellar while my wife picked up a pack at Rouse's. The three 4-packs I ended up with (so far) were bottled on 6/4, 6/6, and 6/7, but I didn't notice anything different between the three bottlings. Ghost in the Machine is brewed to 8% abv, and "brewed with obscene quantities of hand-selected Citra hops" according to Parish's website. Citra is known for (and this should be obvious) a distinct citrus flavor, and Ghost is one of the better examples of how strong the citrus notes can be. The hop profile can vary slightly from year to year and between different hop yards but Citra is always going to give a strong orange/grapefruit profile. On the pour, this batch of Ghost is the distinct bright reddish-orange color with all the haze in the world and a finger worth of bubbly head. The aroma is that enticing combination of bitter hops and citrus, with the primary note in this batch being grapefruit, although hints of orange and lemon come through as well. The joke online is to compare this beer to Sunny D, and although I totally understand where that comes from, the hop oils in Ghost and other IPAs give a much more bitter feel on the palate and then there's the alcohol content to deal with. Although into the double or imperial range, the 8% abv on Ghost is very well masked by the obscene hoppiness and all the citrus notes, giving the beer a clean pleasant finish. The finish really just makes me want another sip, and then another beer, and then another 4-pack. I don't mean to make light of addiction, which is a serious issue, but this is so delicious and drinkable that it's hard to just slowly sip and stop after one. 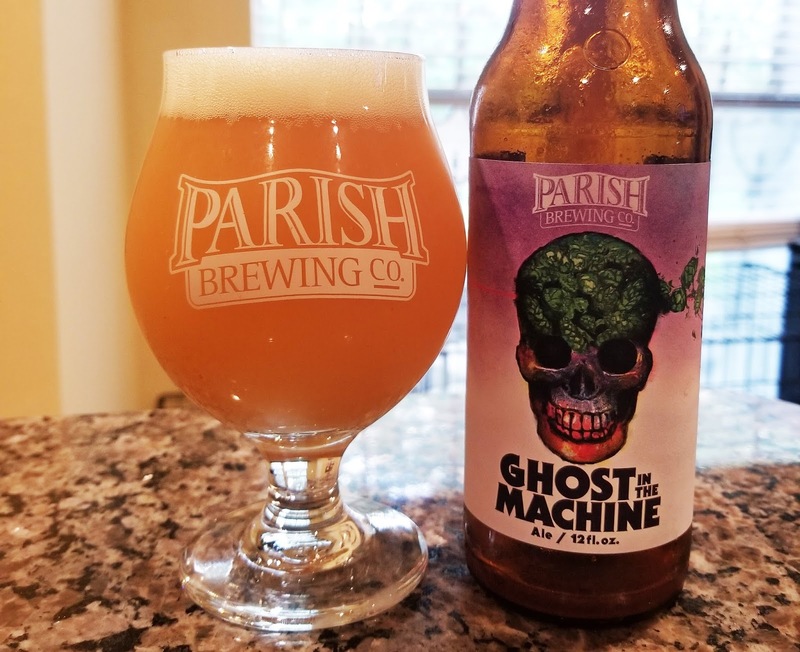 As usual, Parish keeps killing the NEIPA game, and I'm thrilled to have Ghost in the Machine as a regular addition to store shelves throughout the summer. Cheers!